(19383.1.1, Frederick S. Barde Collection, OHS). (16828, James Griffith Collection, OHS). Located on the south bank of the Beaver (North Canadian) River in Beaver County, Beaver is fourteen miles north of State Highway 3 on U.S. Highway 270/State Highway 23, or six miles south of the junction of U.S. Highway 270 and U.S. Highway 64. A mile north of the town is Beaver Dune State Park, featuring a formation of sand dunes left by ancient seas that covered the area. The town of Beaver, originally named "Beaver City," is the seat of the Oklahoma Panhandle's easternmost county. It was also the seat of the seventh county of Oklahoma Territory as well as the capital of Cimarron Territory. Beaver began as a halfway stop on the Jones and Plummer Trail, where in 1880 an enterprising man named Jim Lane built a house on the south side of the Beaver River. This house served as a general store, saloon, hotel, and restaurant. Still standing at the beginning of the twenty-first century, the building is listed in the National Register of Historic Places (NR 74001654). The first post office had been established on the north side of the river in 1883. In 1884 Lane moved the post office to his store and became the postmaster. Charles Edward Jones and Joe H. Plummer had carried crucial supplies to Gen. Nelson A. Miles and Gen. Philip H. Sheridan during the 1874 Indian campaign. The two merchants had also shipped buffalo hides north, as well as materials for building Fort Elliott at Mobeetie, Texas. This brought much traffic to the new, multipurpose house. Lane built a corral and livery stable adjacent to the store to accommodate freighters and cattle drivers. In the town's early history the Beaver River flooded out one of the original two streets, Main Street, and businesses were built on the other street, Douglas, running south up the hill from the river. Since the area belonged to no state or nation, there were no laws. A vigilante committee tried to enforce its own justice until 1886, when the area known as No Man's Land or the Public Land Strip was organized illegally into Cimarron Territory, with Beaver City as its capital. The federal government never recognized the territorial government, but Beaver City remained the seat of business and law enforcement. In 1900 the population was 112. 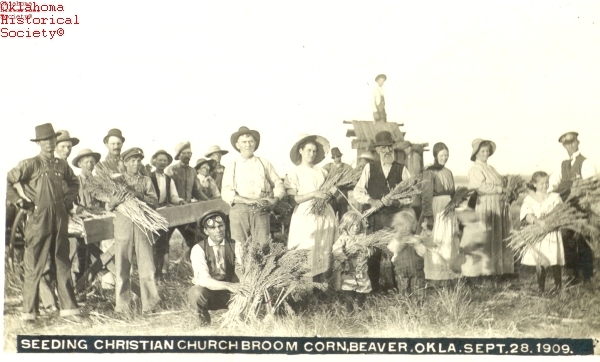 The economy of Beaver City and the surrounding area depended on cattle ranching until 1902–03, when the Homestead Act brought farmers, whom ranchers sometimes derided as "pumpkin rollers," to the area. This changed the town's population and commerce. One of the first businesses was the Groves Hotel, later known as the Thompson Hotel. It was built in 1885. 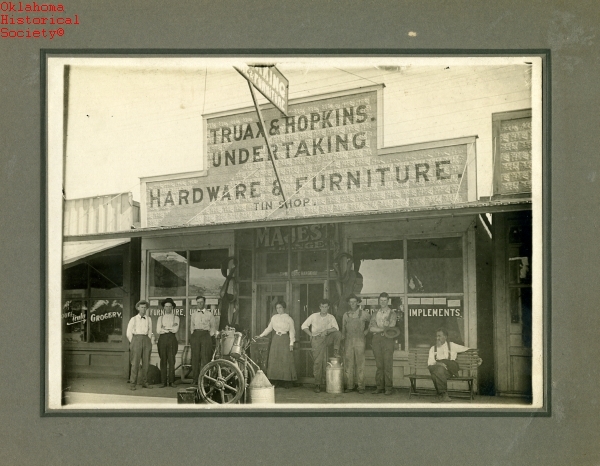 In 1891 Carter Tracy moved to Beaver and built a general hardware and implement company. The first newspaper was the Territorial Advocate, established in 1887. Although the name changed to the Herald Democrat, the paper continued to inform the county into the twenty-first century. In 1905 W. T. Quinn established a telephone exchange. The 1910 U.S. Census reported 326 inhabitants. In the early years of the twentieth century two banks, the Bank of Beaver City and the First National Bank, were established. The Beaver, Meade and Englewood Railroad was built to connect to the Missouri, Kansas and Texas Railway in Forgan, seven miles to the north. Other new businesses included the OK Barber Shop, the Beaver Cleaners, the Goetzinger Grocery, the Beaver Motor Company, the Home Lumber Company, and a number of saloons and hotels. During the Great Depression and the Dust Bowl the town, as well as the rest of the area, suffered, and the population greatly decreased. The town of Beaver, however, actually grew from 920 in 1920 to 1,028 in 1930. The community then began to expand, with a 1940 population of 1,166 climbing to 2,087 in 1960. At the end of the twentieth century the economy was based on cattle ranching, wheat and milo farming, corporate hog farms, and oil and gas production. The town consisted of two banks, numerous businesses, varying from hardware stores, oil-field suppliers, a dress shop, flower shops, a car dealership, insurance businesses, gas stations, a grocery store, a car wash, attorneys' offices, accounting firms, motels, and restaurants. The Beaver County Pioneer Library and the Jones and Plummer Trail Museum offered books and artifacts for researchers. The Beaver County Fairgrounds hosts the World Cow Chip Throwing Contest that is held in conjunction with the Cimarron Territory Celebration in April each year. A county fair is held there in September, and numerous other events occur throughout the year. The town also accommodates a hospital, nursing home, and two medical clinics, one that was headed by Dr. Ed Calhoon, a fifty-year practitioner of medicine in Beaver. There are ten churches, among them the Presbyterian Church, established in 1887 and built at a cost of one thousand dollars. The church building was listed in the National Register of Historic Places in 1974 as "the oldest church in Oklahoma Territory" (NR 74001655). The Beaver County Courthouse is also listed (NR 84002964). The 2000 U.S. Census reported 1,570 residents, and in 2010 Beaver had 1,515 inhabitants. A History of Beaver County, Vol. 2 (Beaver, Okla.: Beaver County Historical Society, 1971). V. Pauline Hodges, ed., A History of Beaver County, Vol. 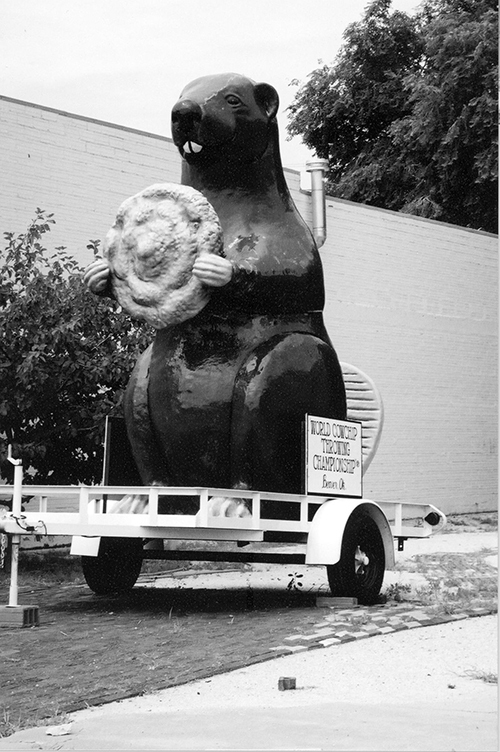 3 (Beaver, Okla.: Beaver County Historical Society, 1993). V. Pauline Hodges, "Beaver," The Encyclopedia of Oklahoma History and Culture, https://www.okhistory.org/publications/enc/entry.php?entry=BE005.